We've not been big fans of the cheaper, American-ized version of the new Volkswagen Jetta. The Jetta GLI offers some course corrections: 200 hp, independent rear suspension, a manual standard and an interior who's first cousin isn't Fisher-Price. 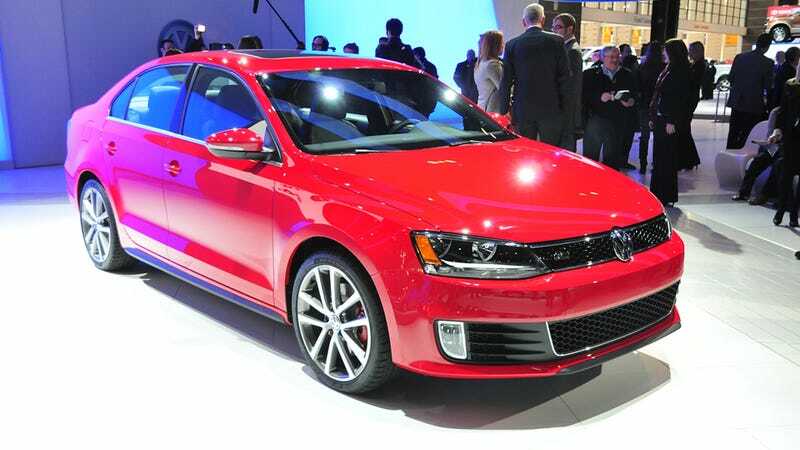 Revealed today in glossy red at the Chicago Auto Show, the Jetta GLI will hit the streets in May, with prices starting at $23,495. Power comes from the venerable turbo four-cylinder, mated to the standard six-speed manual or an optional dual-clutch six-speed autobox with paddle shifters. Sports bling includes honeycomb grilles that scrub a little beige off the design and red brake calipers, which add back in a touch of cliché.